1.1 These Rules of Play are designed to establish a common ground amongst recreational players. I will do my best to follow these rules. 1.2 When playing as a walk-on, players are to follow the local rules, and abide by the guidelines for recreational play. 1.3 Many of the following rules have been established to promote sportsmanlike conduct. 2.1 Designated Safe Areas: The area where players can remove their goggles and where BARREL SLEEVE MUST BE INSERTED and where NO SHOOTING IS ALLOWED. The location and boundaries of these areas will be exactly defined by the field staff. 2.2 Designated Shooting Area: The area where GOGGLES MUST BE WORN and where it is permitted to remove barrel plugs and discharge paintguns. This includes (and is not limited to) the playing areas (fields), the range, and the chronographing station. The location and boundaries of these areas will be exactly defined by the field staff. 2.3 Dead Box: The area where players proceed after they have been eliminated from a game. 2.3.1 NOTE: A Dead Box is generally within the Designated Shooting Area. Therefore, BARREL PLUGS MUST BE INSERTED and GOGGLES MUST BE WORN in the Dead Box. 2.3.2 The boundaries/locations of the Dead Box(s) will be exactly defined by the field staff before each game. 2.4 Field Staff (or Referee, or Ref): Any person who is working at a paintball field in an official capacity. 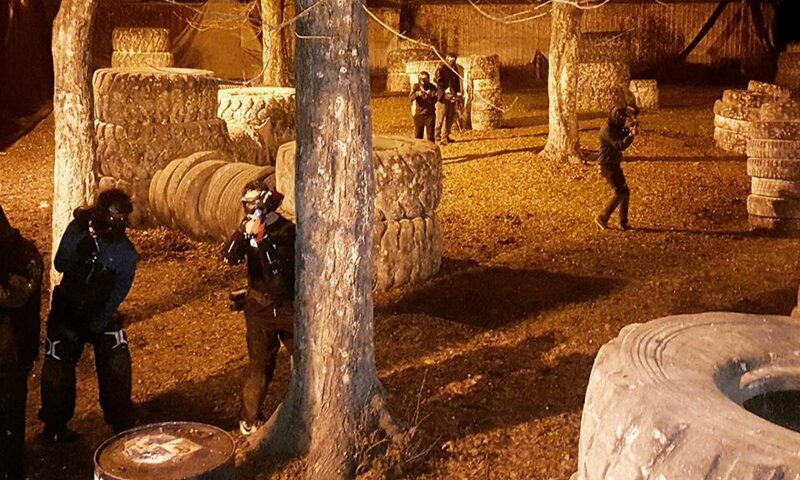 2.5 Player: Any person who plays paintball and is consciously abiding by the rules for Recreational Play. 3.1.1 The only goggles which are permitted to be used are those specifically designed for paintball. 3.1.2 The goggles must have face protection (a mask), and the mask must at least cover the front of the face. 3.1.3 The goggles should have ear protection designed by the manufacturer for the mask that is being used. 3.1.4 Goggles are to be worn BEFORE the player enters into the Designated Shooting Areas. 3.2.1 Barrel plugs will be inserted into the barrel of the paintgun BEFORE entering into any Designated Safe Area. 3.2.2 Squeegees are not acceptable substitutes for barrel plugs. 3.2.3 Paintguns will NOT BE DISCHARGED FOR ANY REASON while in the Designated Safe Area. 3.3.1 All paintguns and airsoft guns will be chronographed. 3.3.2 Paintguns will be set at no higher than 285 feet per second for outdoor play and 265 feet for indoor play. Airsoft Chrono limit — 400 and under fps. DMR chrono limit is 450 fps with engagement rule of 50 feet. Sniper chrono limit is 500 fps with engagement rule of 100 feet, and you MUST have a side arm. 3.3.3 Ref is to supervise chronographing. 3.3.4.5 When requested by another player. 3.3.5.3 After decoupling, and subsequently recoupling, remote systems. 3.3.6. The above chronographing guidelines are in place because they all affect the performance and settings or a marker. 3.3.7.1 No tools of any kind shall be allowed onto the Playing Area, this includes any type of knife. 3.3.7.2 Incendiary, explosive or smoke generating devices are not permitted, without the approval of field staff. 3.3.7.3 Aggressive physical contact between players is not permitted. 3.3.7.4 The use of any intoxicant is not permitted before arriving at the field and while at the field. 4.1 Access to any velocity adjustment device must involve partial or complete disassembly of the paintgun or components thereof and/or require the use of tools to do so. 4.2 Velocity will be adjusted to 10 feet per second below the field limit, for extra safety. 5.1.3 Any time a player surrenders. 5.2 If the paintball HITS but DOES NOT break, that player is still in the game, UNLESS THAT PLAYER INDICATES BY WORD OR BY GESTURE THAT THEY HAVE BEEN ELIMINATED FROM PLAY. As a courtesy to his/her opponent, the player shall announce “BOUNCE” or “NO BREAK”. 5.3 When eliminated the player MUST indicate by saying “OUT!” “HIT!”, or “DEAD!” in a loud voice and raise one or both hands above the head. The player then proceeds to the area that was designated for eliminated players to go. 5.4.1 Eliminated players are not permitted to communicate with other non-eliminated players in any way. 5.4.2 Eliminated players are not permitted to purposely interfere with the course of the game. 5.4.3 Eliminated players are expected to act in such a way that other players know that they have been eliminated from play (by WORD and GESTURE), until they are off the field of play. 5.4.4 The ³tactic² known as the Dead Man¹s Walk is not permitted. This is a technique wherein a player PRETENDS to have been eliminated by walking casually along the field in a non-aggressive manner. When said player has reached an advantageous point on the field they immediately engage in play. While not cheating in the strictest sense, it is unsportsmanlike to take advantage of another player¹s trust in this way. 5.4.5 Players must keep in mind that they may be hit, after being eliminated, if they are not displaying behaviour as outlined in Rule 5.4.3. It is the eliminated player¹s responsibility, not the players still actively playing. 6.1 Players will be briefed on the format (one flag, two flags, straight elimination, etc. ), the time limit, the elimination rules (one hit/out, reincarnation, etc. ), and any special rules/restrictions by the Field Staff before each game or series of games begin. 6.2.1 Standard Capture the Flag. The team who first captures the opposing team’s flag AND hangs it in their own flag station, before the time limit expires, will be declared the winner of the game. 6.2.2 For any other game, the objective will be clearly stated before the game begins. 6.3 During any Capture the Flag game, if the player carrying the flag is hit, the player must drop the flag immediately. 6.4 During any Capture the Flag game, the flag must be carried so that is fully exposed and cannot be rolled up and/or hidden under clothing. 7.1 Field staff instructions will be obeyed at all times. 7.2 If a single player marks another player with three or more shots in rapid secession,(3 splats) the player who was shooting is also out of the game.